Sarah Black was born at Virginia, USA. She married Henry Bobo, son of Gabriel Bobo and Elizabeth Garner, on 15 August 1799 at Maryland, USA. Her married name was Bobo. Dorotha Blanche was born in 1900.1 She married Henry Neil Masters, son of Leonard Oliver Masters and Margaret Jane Gilbert, in 1933. Her married name was Masters. Volney Blower married Floretta Bobo, daughter of Joshua C. Bobo and Mary Black, on 21 August 1870 at Vinton, Ohio, USA. Johann Bluhm was born in 1807.2 He married Hannah Weldi in 1820. [S24] Mathias Blum, Photocopy, App #739701; Pen # 777507. [S253] Judith Hall, "Judith Hall's Research", This source supplied Anna Marie Blum's middle name. [S25] Letter, Jrames R. Beatley Jr to Carl J. Denbow, 26 Dec 2001. 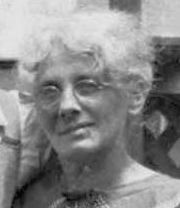 Elsie Mary Blum was born on 23 March 1891. She married William Worland Taylor, son of Richard E. Taylor and Ruthey Jane Masters, in August 1917. Her married name was Taylor. Elsie Mary Taylor witnessed the death of Lena Dora Linke on 4 March 1934.1 Elsie Mary Blum died on 31 October 1970 at Columbus, Franklin, Ohio, USA, at age 79. [S253] Judith Hall, "Judith Hall's Research", This source supplied Heny Mathias Blum's middle name. [S243] Teresa Herrmann Research, online https://www.ancestry.com/connect/Profile/…, This citation supplied the fact that his given name was actually Heinrich, not Henry. [S258] Henry Mathias Blum, Death Certificate. [S254] 1880 U.S. Census, http://www.ancestry.com, Census Place: Columbus, Franklin, Ohio; Page: 46C; SD: 5; ED: 21. [S245] Ida Blum Miller Order Form, Carl Jón Denbow, 17 Coventry Lane, Athens, Athens, Ohio, USA. [S246] John W. Miller Order Form, Carl Jón Denbow, 17 Coventry Lane, Athens, Athens, Ohio, USA. Joseph Blum was born in 1888.1 He died in 1922. 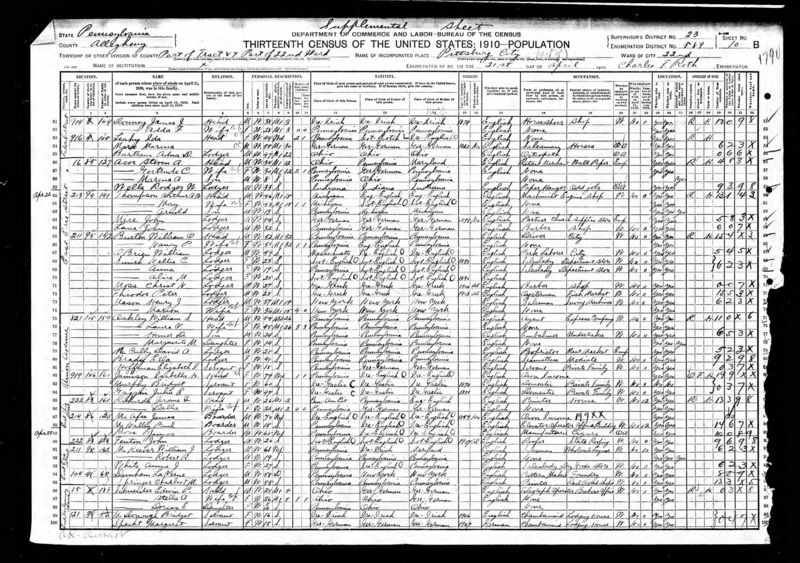 1910 U.S. Census, Pittsburgh, Pa.
[S241] Stella Blum Schneider, Death Certificate. Alice Bobo was born on 16 August 1877. She Lived in Columbus, Ohio. 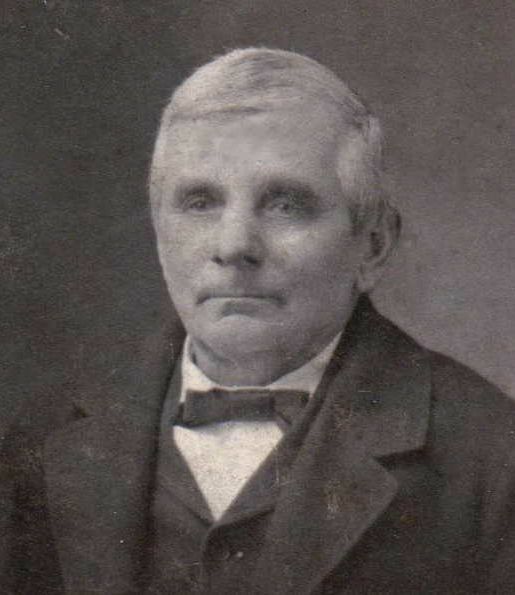 Allen Bobo was born in 1845. Amos Bobo was born in 1834.